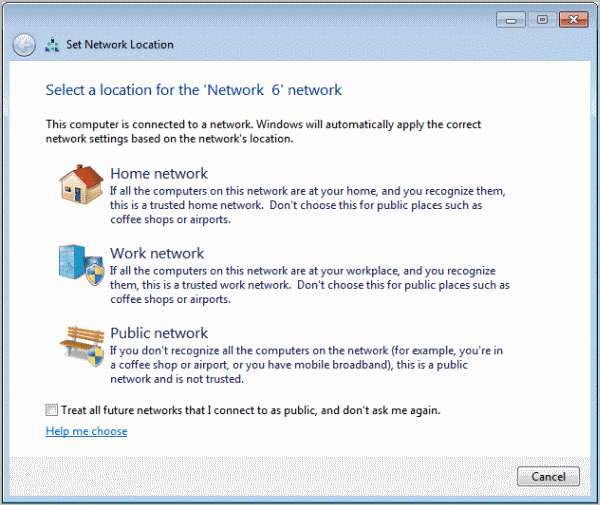 When you first setup a network under Windows, you are asked at one point to select a location for that network. Available for selection then are a Home Network, Work Network or Public Network. The explanations offered on the selection page are not that helpful in making an educated decision. The problem here is that the impact of the decision is not made clear. How is Windows distinguishing between the different network types? Which features or functionality are blocked or available under each network? Home network: If all computers on this network are at your home, and you recognize them, this is a trusted home network. Don't choose this for public places such as coffee shops or airports. Work network: If all the computers on this network are at your workplace, and you recognize them, this is a trusted work network. Don't choose this for public places such as coffee shops or airports. Whenever you connect to a network, a network location needs to be selected. 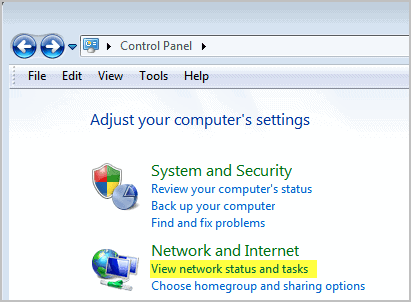 Windows based on this selection assigns a network discovery state to the network. To make it simple: Network discovery affects if a computer can be seen and see other computers on the network. Windows supports three different network discovery stages: On, Off or Custom. Next to seeing and being seen in a network, network discovery handles file sharing, public folder sharing, printer sharing and media sharing in the network. Users who select the custom option can enable or disable specific sharing and discovery features. Microsoft notes that "network discovery requires that the dnscache, fdrespub, ssdpsrv, and upnphost services are started, that the Windows Firewall exception for network discovery is enabled, and that other firewalls are not interfering with network discovery". Network Discovery is only enabled on Home and Work networks, and not on public networks. The selection here has an impact on which services and features are available. But what is the difference between home and work networks then, if both support network discovery? Home networks support the Homegroup feature, making it possible to create and join Homegroups if supported by the operating system edition. Work networks on the other hand cannot create or join Homegroups. The safest choice, when it comes to networking, is the public network. But this is only the best choice if the sharing options are not needed, and if the computer does not need to be connected to (or create) a Homegroup. Click on the start orb and select Control Panel from the Windows Start Menu. Click View Network Status and Tasks. You see a list of all networks the computer is currently active on, and whether that network location is set to home, work or public. You can change the network location at any time. Just click on the current location in the Network and Sharing Center listing in the Control Panel to open the Set Network Location screen again. you can read my mind! i’ve just wondered what the difference is a few days ago. I have been wondering for a long time… but I still don’t know what to choose when I plug in the LAN cable that connects the computer to the router. Obviously I do this to connect ultimately to the internet (public network) but in the first instance I do connect to the router which is in my home (homenetwork)….??? this location based setting is all about the LAN, not the Internet.Most users should be fine with selecting Public Network, which is more secure than the other two. It for instance makes sense to select Home or Work if you need the sharing services. Thanks so much – I was thinking about this the other day. However – is it still OK to use the public network at home? I don’t share my computer, and I’m looking for the most safe and secure option possible. Yes that is fine Chris, as long as you do not need the network sharing options. If you chose Public Network then also be aware that this may affect how some games function. I have the Home Network with sharing off. If you do need to share files on a Home Network it can always be re-enabled. A word of caution if you use offline files. I have discovered that under some circumstances when roaming, this selection can turn encryption on for offline files, making them read only and giving sync errors when returning. where I have posted details of how to track this down and fix it. But if you have problems after roaming, be aware that the network type choice mah have changed settings for you. If I connect my work computer (which is managed and monitored by my Work System administrator) to my home network/router as a home “location” with a homegroup, would that allow my work system administrator complete access to all my home computers? While there may be file sharing and printer sharing advantages, this to me would be a disadvantage. There is absolutely no difference. They are made just to make your life bitter. Why the hell would someone want a separate settings for Network Discovery under both public and private networks. How is the machine supposed to know if there is a potential Home network, if you have Network discovery turned off. If it is turned off, then you can’t find a network. If you can’t find it, then you cannot know if it was Home or Public in the first place, etc….